I’m really excited that the “legacy” is coming back to DC comics. For the past few years reading DC has felt sort of sterile and, because of that, I’ve cut down my DC reading to just a few titles I follow through the good and bad times. But I have some hope this change will bring back what seems to have been lost through the New 52. Here are a few wants (probably more like dreams…) I have for the reboot that isn’t a reboot. I’m going to focus on my favorite area of the DC universe: The Green Lanterns. As far as I know there isn’t a term for the Green Lanterns of Earth other than saying ‘Earth Lanterns’. Since the New 52 we’ve been introduced to a few new Lanterns or Lantern like characters. However, we’ve also lost a few who were at least mild heroes and villains before Flashpoint and I believe having them back would add interesting elements to the GL books. Since Alan Scott was reimagined as a homosexual DC removed his children from existence. Ignoring that Scott could still have adopted children or had children in a previous relationship, Obsidian went from being Scott’s child who happened to be gay to something different entirely. According to the Wikipedia page the Obsidian I know and love returned in Convergence. However, Convergence was not the best story and I ended up skipping all but the main story which wasn’t so compelling either. Here is hoping that Obsidian is back and gets some focus within the Rebirth. Another child of the original Alan Scott, Jade seems to be missing from the New 52. It’s possible she exists but I haven’t read any books with her in any capacity but I have a feeling she was removed or, at the very least, down played to near non-existence. When I was getting back into comics as an adult Jade and her brother had at least major-minor character status in JSA and other books. I have a bad feeling that, since we have Power Ring maybe there isn’t the same space for Jade to occupy: A female with similar GL powers but not exactly a Lantern. Here is hoping I’m wrong! Prophesied to be the last of the Green Lanterns in the future, and an important host to Ion, Sodam Yat has been pretty boring in The New 52. Pre Flashpoint he had created some kind of offshoot of the Lanterns where his own people, the Daxamites, follow him towards being less xenophobic. Heck, I thought we were seeing the birth of a new Lantern Corps that would less spectrum based and closer to a religion. An intriguing story line which seems to have been largely left dangling. In the previous universes he was one of my favorite characters. Also known as Cyborg Superman. You remember, one of the 4 Supermen that came to be after Superman “died”. Hank is one of the more interesting thorns in the Lanterns side yet has been pretty absent since the reboot even though he does exist in some form. I would love to have the emotionally upset and misunderstood Henshaw back. The man who who led the Alpha Lanterns and Manhunters trying to find his humanity (or lack of it) among the stars. There’s just something about the character that, when he emerges from the shadows in an arc, adds credibility and strings back in history to the story. That is Hal Jordan. Really. I’m hoping we get Hal back. Don’t get me wrong, it’s fine to try new things and take characters in different directions but what was done with Hal in the later New 52 just didn’t work in my opinion. While not directly a Green Lantern character, Jaime Reyes as the Blue Beetle with the history of past Blue Beetles is something I have missed. Jaime is my favorite Blue Beetle, mainly because he was the first o ne I really took notice of, but without having a legacy to stand on his character is a bit boring. Not only that, but in the past the scarab has been noted as a weapon of the Reach (an enemy of The Guardians of the Universe). There has been some development around that in the New 52 as well as pre-Flashpoint but it seems like there is still a lot of stories that could be told to round out the Reach, Blue Beetle, Black Beetle, The Guardians of the Universe, The Controllers, and the Lantern forces. By this point Rebirth is has been running for a bit. I’ve purposefully been holding back from reading my issues so I can immerse myself in the rebirth story line in hopes it brings back the spark. What is it you hope Rebirth will bring? After posting a list of what I’ve been reading consistently over the last few months a reader noted I should give Team 7 a go. I had read #0 early on and thought the idea seemed interesting but didn’t end up following through. I used Comixology to pick up all available issues so far to give it a fair shake. These are my thoughts. Note: these are overall thoughts for the current #0-#4 run. Man is she boring. I really miss the old 52’s chubby, smart and powerful Waller. Yeah, she wasn’t an action hero but she was more interesting than fit, strong analyst Waller. Some one please give her a cheese burger! It only takes a bad diet for her to be awesome. Slade makes a lot of sense on this team (and he isn’t the only one). I’ve found his character interesting over the years but find him most interesting when he is a part of the story (and not the story itself). He adds that rougher merc style which adds balance to the team. As someone who never read many Wildstorm comics (before my comic reading time) I know little about Cole. Of everyone he is closest to the understating jokester of the group and it works. So far I put him in the same camp as Slade: really good on a team book but not sure solo books would be interesting. This guy is probably my favorite on the team. He’s the big guns and us without the in your face attitude. Of all of them he seems the most trustworthy and most eager to do things right. It’s nice to have that kind of presence on a team. Black Canary but so far not a whole lot from her. She is there but, other than her dynamic with future husband Kurt Lance who is stated as her team weakness, there isn’t much to pick her out in the story (yet?). In some ways he seems like the new kid. He has talents for finding things but no real field operations experience. In issue #1 he almost dies falling during a landing maneuver… something no one else had an issue with in the slightest. Not sure what this finding talent or background that Waller eludes to is yet but I’m positive it will be revealed in time. Seems like the hot shot pilot who knows she’s the best. With exception to the very start of the arc she has been absent. Another Wildstorm original. Apparently a coworker of Slade who is more about money and having fun. Not a ton about him yet but he does seem to have a jokester personality not too different from Cash. Strategist with the amazing ability to change ethnicities. He acts in some ways as the voice of the boss when in the field. Not much else yet except really silly glasses that make him look like a 90s character. So far there is a good balance of personalities but there is still a lot to learn about the team members. As long as the writer focuses on the team dynamics more than highlighting previously known and popular characters I can see this working. I also can’t help but wonder if at least one character is here just to he can be knocked off…. In a nutshell the story is a lot like a science fiction/military action movie mashup. It’s pretty fast moving, lots of weapons and much less focused on super human abilities at this point. Issue #1 is all about starting the first arc while getting quick bios on the cast. If you know much about DC bad guys there are some really strong hints dropped about who they will be up against. I called it at that point and was validated at the end of issue #2. Issues #3 and #4 lead up to and down from this arcs main villain who seemed to take a fall a little to quickly. Not too easily mind you, just too quickly. I’m not sure if this is due to some pacing issues or if there is a reason that will be disclosed later on in the stories. The art in issue #1 and #4 is quite good though some of the character designs the artist is working with doesn’t always help. Again, Higgins. Issue #2 is not bad but issue #3 seems like it’s, for lack of a better term, over Inked. It also has a bit of a rushed feel. Thinking back on issue #3 Cole’s hair stands out as looking rushed as it is too angular and stiff. Don’t misunderstand me, none of the art is bad. I’d love to have half of the artistic talent of any of them. Based on its premise I’m pretty sure this will run for a few years at best. That’s not a bad thing but it may also scare some readers away being that it is not billed as a limited series. It should be obvious that there is only so much time to explore between the formation of this team and the start time of the Justice League. If the book gets canceled rather than ending on its own it can mean that a story drags on longer than it should with tons and tons of tie ups condensed in a few issues in an attempt to finish the overall story. I can’t think of a time in which that was a good thing. Let’s hope the writers have a specific ending in mind. It’s not a bad book especially if you like the action team style stories. If you were a big fan of Wildstorm there is no reason to avoid this book assuming you can accept it as a new take on a previous idea. I can see this being read best in trade form but picking up the current back issues via Comixology can give a similar feel. It’s worth the read and I will be following it for at least another few issues to see how things pan out for the team. He’s confused. He is full of nanites which talk to him in the form of a child. He was a brainwashed weapon. Now he wants to get to the bottom of things and has little to lose and his life to gain. If it wasn’t for a long plane ride and a sale I’d have likely overlooked Bloodshot. If you are a fan of military based action movies and enjoy science fiction then Bloodshot’s your comic. I’m lumping all Green Lantern titled books here since there is a number of them. I’ve been a GL fan for a long time. I love the idea of being a space cop and being forced into a larger universe that isn’t impressed with humanity. Even when the books go weird and, well, bad I’m probably going to still be reading them. I feel like this series could be a lot better though I’m new to sure how. I grew up more sense to with Wally as Flash so having Barry around without the whole Speed family around is weird. It’s not bad by any means but I think it has unmet potential. Of the monthly books I pick up this is one of those I forget about on a regular basis. What if the research and development department created to produce the first atomic bomb was a front for a series of other, more unusual, programs? What if the union of a generation’s brightest minds was not a signal for optimism, but foreboding? What if everything… went wrong? When Grayson was Batman I pulled Batman and Robin. Now I read Batman. I still pick up Batman and Robin from time to time but it seems like the main title gets the harder hitting plot points right now. With Joker making his way back it’s an interesting arc for sure! This is a comic which you have to really like the characters before reading to enjoy. Even though Flash Gordon has been a comic for a very long time there is something a bit refreshing in the setting and art. In this series Ming’s ability to backstab and control is masterfully expressed. Originally I picked this up because Nova was part of the team. Now I continue simply due to the story line. The second and third arcs were slower than I would have liked and really gave little clue as to where things were really headed. There were little hints here and there but it wasn’t until recently that it feels like things finally are critical. If you want to jump in on this then pick up a fee back issues first. How can I not get this? Not due to the story (I’m iffy on it still) but due to the art. Hey, it’s probably get more interesting but until then it’s still fun to look at. A visigoth future king gets ahold of one of a kind alien war armor and comes to present times. Needless to say this is a guilty pleasure comic. It’s not poorly written but it is pretty action packed and follows on thread (at least so far). It’s also the comic that got into Valiant’s universe and I’ve really been enjoying it. By name and description I figured that this would be one of the Valiant books I’d not be reading but I was wrong. A friend and coworker of mine recommended it to me and after taking my time I finally picked up the first issue on Comixology. The same day I purchased all of the available issues of the current series. It has that great combination of humor, action, sci-fi and possibility for deepening story that really pulled me in. This one is another guilty pleasure but not one I (or others) would generally recommend. Cable is a long time favorite of mine and X-Force is a team I grew up on. This iteration is a bit different but having Cable back in X-Force makes a ton of sense. It’s only few issues in and I’m enjoying the story even if it is the normal ‘Cable has a vision and he will probably die to keep that vision of the future from happening’ thing. Huh. When I write it down I’m not sure why I enjoy it so much… Ah, that’s right’ nostalgia. Ever since Blue Beetle went into space I’ve been digging this series. I’ve never been totally clear on the scarab other than it originated from space and the creating race did would at times fight against the Green Lantern Corps. It’s nice to start seeing more about the scarabs origin and the species who created it. I’m hoping the writers will continue Blue Beetle in the galactic setting for a while as I think it’s really working. In the 1990’s comic book movies were for comic book fans to not enjoy. In fairness, this is not much different than traditional book fans and most of the movies made from them, but comic book fans are just rabid about sticking to stories. If the story is too much then at the very least, it’s expected they stay true to who characters are or were. I know this because I am a comic book fan and cringe when I see characters molded into Hollywood super-types instead of highlighting the deep multidimensional traits common in our heroes. In any case, the Guardians of the Galaxy (GotG), one of my favorite Marvel teams, is in process of making it to the big screen. Part of me wants to jump up and down in excitement. In my opinion GotG is much more fun and interesting than The Avengers. I know, that’s crazy talk for many people but that’s what I think. Another part of me is worried. Worried Hollywood will do to GotG what they did to Daredevil, or Parallax, Deadpool, etc.. But really the movie isn’t what is getting me excited about GotG. It’s something else. A few years back I started to read Nova mainly because I had read most of the Green Lantern books that were available. I like cosmic level and/or SciFi stuff and this, like GL, fit the bill. It even is sometimes jokingly referred to as Marvels lanterns as there is some similarities. As I read more and more I started to realize how interesting of a character Rider (Nova) was. And from there I went to read Annihilation followed by GotG. It was good stuff but the creative team decided to focus on other characters in the cosmic realm. I ended up following the writers through their other cosmic teams but never felt the same pull to them as I did GotG. But there is hope again. Bendis and McNiven are writing a new series! In general it sounds great (except the Iron Man part…). We are getting Star-Lord back. Star-Lord! One of my favorites! That also brings hope for Rider at some point down line as well. We also get Rocket Racoon, Groot, Drax and Gamora (it looks like). I’m hoping Bendis and McNiven can take the team in a direction that finally solidifies them as THE cosmic team in the Marvel Universes. And also drop Iron Man. Seriously. Well, unless we can see Nova wipe the floor with Iron Man’s weak tech. So that’s why I’m excited. There is hope for a great cosmic team to be in the forefront again. The movie is nice but the books will be where the action and creativity will shine. 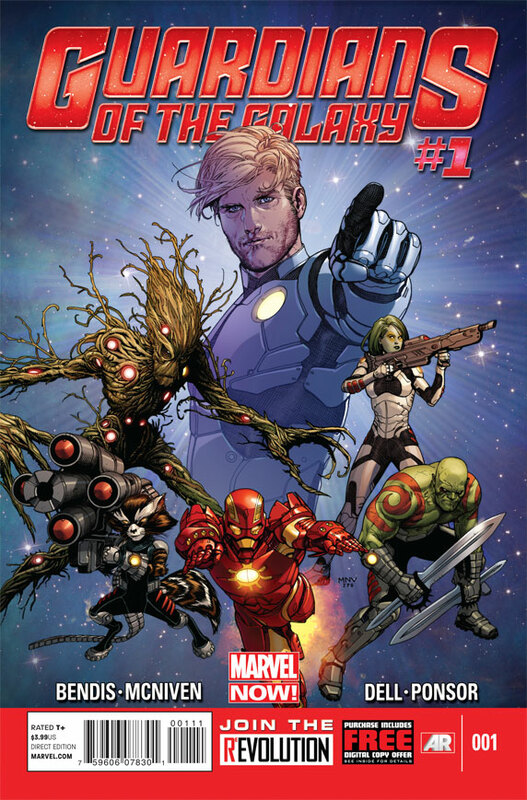 Guardians Of The Galaxy #1. Read more at IGN. Valiant: Who would have thought? If you asked me a year ago about Valiant comics I’d likely give a puzzled look. Yeah,there are many publishers but Valiant isn’t one I knew. Now I find Valiant in my pull list a few times a month. What initially got me interested was X-O Manowar. The idea behind the character intrigued me. Though the first issue almost lost me. It was good but oddly paced. After a few issues introducing some history and more figures of interest I became hooked. But then they had to do a crossover. Those silly gimmicks where it’s more marketing than content. But this was different. Yes, there was marketing involved but the story made sense and introduced a figure who, under other circumstances, I would pass up reading. This got me thinking. Is Valiant actually challenging what I normally think about when I see a comic? Are they actually trying to be different than the rest of the industry? Are they making superhero comics for people who like comics? Right now I’d say yes (assuming they run with the original universe). There is a feel for real continuity (not the “It’s fun, isolated stories.” junk.. I’m looking at you Marvel.) which is something I go crazy for. I think it’s clear they love the characters that existed in the Valiant universe and are taking care in reintroducing them. And I hope it continues. Now l, excuse me while I read the Shadowman preview followed by some Bloodshot. I am a fan of technology and comics so when Sony started providing comics through their Playstation Store service I decided to give it a go. It wasn’t bad for an early go and I enjoyed the ability to download and read comics on a whim. Yesterday I received an email from Sony which was blank. Well, actually it was an HTML only email which my mail client did not render (as I block HTML email) including a email opened tracking image (http://links.sony.mkt3395.com/open/log/. *) via MarkMonitor. The email had the subject of “PSP (PlayStation Portable) comic content service closure announcement”. I followed the more information link and read up what the plan was. Question: Why are you closing the Comic store for PSP? Answer: We stopped providing new content to the Comic Store last summer to focus on bringing the comic service to other Sony devices. Our focus now is to bring more digital entertainment services to our products. Q: What happens in January when the re-download service for Comic Store is no longer available, will I be able to access my previously downloaded comic content? My first thought was “Great, all my purchases are now dead.” but I decided to avoid being so negative so quickly and clicked for more information on Media Go. Maybe they have a plan for us consumers. Media Go can backup the comics that one purchased but it requires either Windows and/or Sony devices. That puts me totally out of luck. My understanding is that the format of the comics are proprietary so I’d probably be out of luck even if I could back them up without purchasing something to run Sony’s proprietary software. My saving grace is that I didn’t spend a ton of money on getting comics from Sony else I’d be really upset. Sony’s focusing on ‘providing content’ to their other devices. That’s all well and good but I own one of their devices and the comics were some of the content. A better solution for customers would have been to make a deal with another provider of digital comics to allow for continued access to already purchased content. Even if it is proprietary to proprietary (like ComiXology) it would still be continued easy access. “We apologise to fans for the change and thank you for your support of the Comic Store for PSP,” said SCEE’s Mayumi Donovan. I guess some companies are not ready to provide content. I hope they learn from this mistake as I have. In the future I’ll be much more cautions on who I allow be a paid content provider by looking at how they handled the end of previous content distribution.